[T]he market has become a haven for offshore investors, who are pumping record amounts of capital into US office assets, especially in primary urban cores. According to JLL research, foreign office investment surpassed $20 billion in 2016, accounting for 16% of the overall acquisition volume. And while, historically, Canadians have been the most active foreign players on the market, Asian and German investors are now stealing the spotlight. Notable purchases by foreign entities included China Life’s $1.64 billion purchase of 1285 Avenue of the Americas in New York, in a joint venture with RXR Realty (New York); and Hong Kong Monetary Authority’s $1.15 billion acquisition of 1095 Avenue of the Americas. So how is their market timing? The Greenstreet Property Price Index in February was flat for the fourth month in a row. You have to go back to the early 2000s to find a flat spot this long. During the Financial Crisis it peaked, and without dilly-dallying around, it plunged, and then, fired up with the Fed’s free money, it soared. But this time, there is no crisis. It just hit the ceiling. 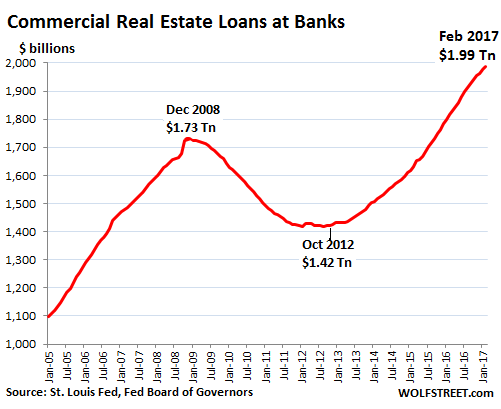 As the chart shows, CRE is highly cyclical. Even the Fed, which rarely worries about asset bubbles and has a passion for inflating them, is officially worried about the CRE bubble and what its implosion might do to the lenders. 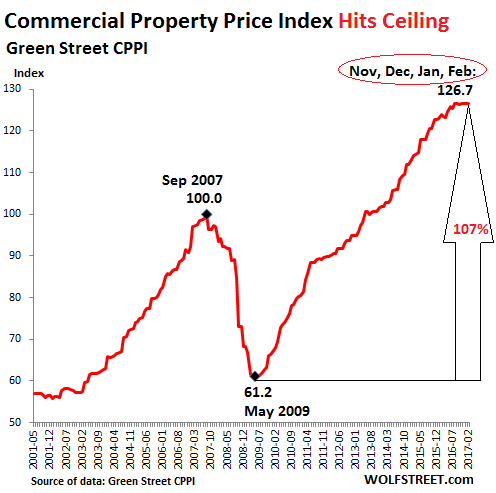 Its efforts to make monetary policy less accommodative are in part targeting the CRE price bubble. So it is unlikely that the plateau of the past four months will just remain a plateau. The biggest culprit was the apartment segment. The sub-index fell 3% in February and is down 4% from a year ago. The office sector still rose 2% for the month and 5% year-over-year. Self-storage which had been white hot, having surged nearly 160% since the trough in 2009, declined in February for the first time since that trough, but was still up 8% year-over-year. The remaining segments – industrial, mall, strip retail, health care, and lodging – were essentially flat year-over year, except malls where the index still eked out a gain of 3%, despite the store-closing and bankruptcy turmoil taking over the brick-and-mortar retail industry. So thank you, foreign buyers, for stepping in at these red-hot prices when we need help the most. But foreign buyers were obviously not the only ones still buying. The largest office building transaction was the $1.93 billion purchase of the AXA Equitable Center at 787 Seventh Avenue in Manhattan, by CalPERS in California, the largest public pension fund in the US. The deal was one of CalPERS’ largest ever investments. It closed in January 2016, before the dark clouds had started to waft over CRE. AXA Financial was the seller. CalPERS is counting on 7% annual returns every year, for all years to come, and even then it is woefully underfunded. So it’s going out on a thin limb to get those returns, and a glitzy office complex, acquired at peak dollars after seven years of booming prices, is one of its efforts in that direction. And borrowing money to fund these transactions is going to get more expensive, which makes the equation tougher to solve for potential buyers. This is an issue for commercial as well as for residential real estate. “Many fear the Fed is behind the curve."